Fuji's new premium compact offers Full HD video recording. 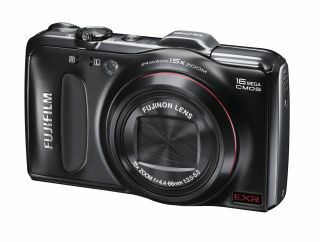 Fuji has released its latest premium compact camera, the FinePix F550 EXR, with 15x optical zoom. Following a string of new premium compacts released this year, such as the FinePix Z900 EXR and the Fuji X100, the FinePix F550 EXR brings raw capture capability and Fujifilm's new triple-core EXR processor. The Fuji F550 EXR also boasts full HD recording at 30fps, GPS functionality and a new 16-megapixel CMOS sensor. An EXR Dynamic Range mode employs dual capture-technology to provide a dynamic range of up to 1600%, which is almost a full stop wider than any other camera, Fuji claims. The Fuji F550 EXR also features an EXR Signal to Noise mode that employs a method of pairing pixels to increase sensitivity for better quality results in low light, Fuji says. Other key specs of the F550 EXR include a 3in rear LCD with 460,000 pixels, advanced Anti-blur technologies and full resolution high speed shooting at 8fps. Available now in black, the Fuji F550 EXR price tag is £329.